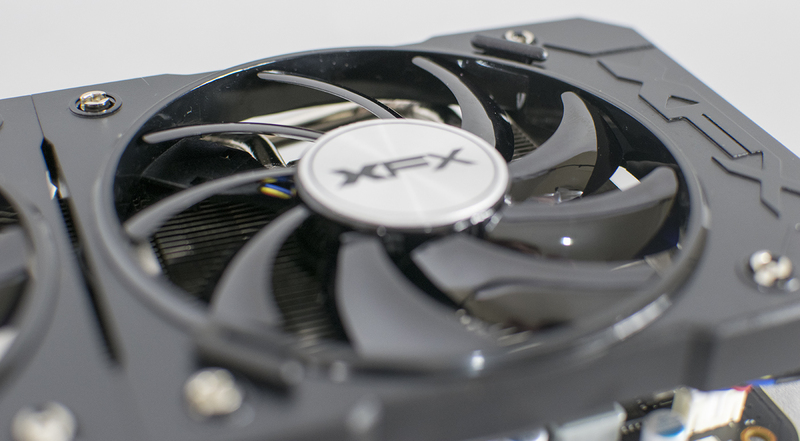 XFX have been around since 2002, but their lineage goes all the way back to 1989 which is when their parent company, PINE who hail from Hong Kong, all the way over in east Asia. XFX, however, is one of 3 divisions of PINE and unlike the other 2, has its HQ based in Ontario California, USA. Back in the beginning, XFX used to manufacturer graphics cards exclusive to NVIDIA, but all this changed back in 2009 when they struck a deal with ATI (now known as AMD). This led to NVIDIA being pretty annoyed and thus struck XFX off their official partner list. Has it affected XFX? Not really, they still remain one of the more well-known graphics card manufacturers on the market offering good value for money, but remaining stylish and focused on performance. 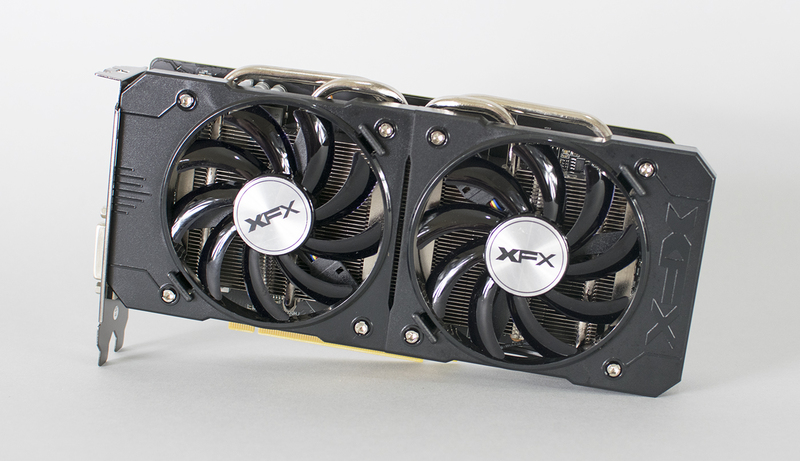 Like AMD have done with their recent rebranding, XFX have followed suit and have launched cards to reflect this “change”; the one we are interested in today is the R9 380 4GB Double Dissipation model. So what do I mean by rebranded? Well the R9 380 series is effectively an older AMD R9 285 graphics card which hasn’t only been recycled, but has been given a higher amount of GDDR5 VRAM; it also comes in with a lower RRP of which the R9 285 was launched at too. Maybe the recent 300 series launch from AMD hasn’t been all that bad, especially for those looking for decent performance, but without the crazy high price tags manufacturers are known for charging for “newer” technology. So what’s the XFX R9 380 4GB DD got going for it then? Well to start with, XFX have changed the Double Dissipation cooler around slightly compared to when we last seen it; this was courtesy of the R9 290. So what is different? Well for the a start, the white glowing XFX logo when powered up is missing, one of the main aesthetical features I was really pleased about, so kind of miffed to see why the trend hasn’t followed onto the R9 380. The card is dual slot so compatible with most ITX and practically all ATX cases; this is due to the short length of just 9.2”. Armed to the teeth, the XFX R9 380 DD features a 2GB and a 4GB variant (today we have the 4GB model) and comes with a slight overclock of 990MHz on the clock over a 256bit memory bus. The memory clock speed sits at a pretty average 1425MHz with the memory chips on today’s particular sample hailing from Hynix. 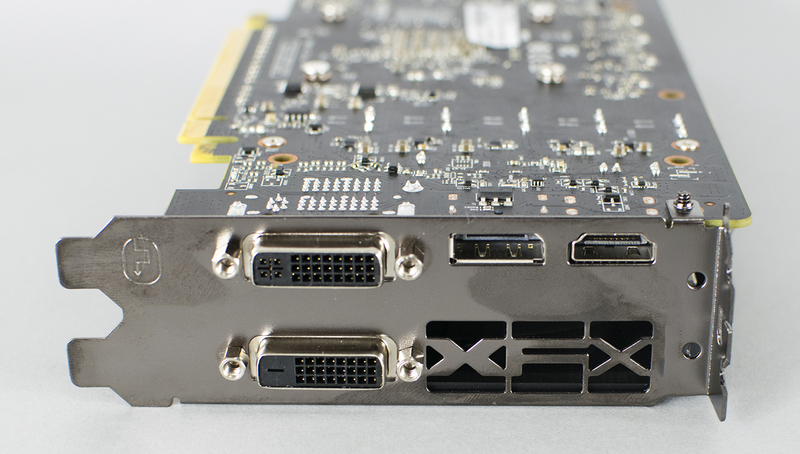 1792 stream processes and PCI-e 3.0 should make this card a potent 1080p warrior although XFX seem to have marketed this card up to 4K gaming which is a little strange to me. 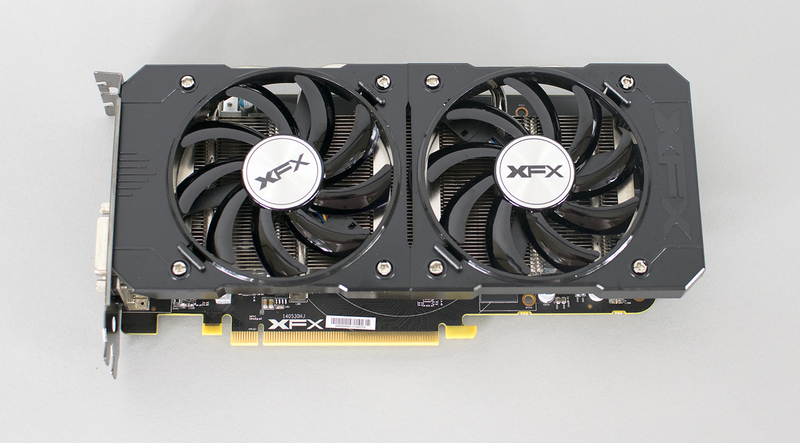 The XFX R9 380 Double Dissipation cooler is equipped with a twin fan, 4 heat pipe cooling design. To further elaborate, the heat pipes are nickel plated copper and both the fans are 9cm. The fans can be easily removed from the cooler itself, but this probably voids the 2 year manufacturer’s warranty so don’t go damaging your card now! Not only the cooler is interesting though, the technology behind it is also pretty impressive. XFX have revamped their Ghost 2 technology with clean airflow over the back of the card, as well as the vapour chamber effect cooling the Double Dissipation cooler utilises. This essentially relates to the Hydrocell thermal solution as XFX call it and what happens is, the liquid goes into the vapour chamber, gets hot, turns into a gas form and then gets transferred through the heat pipes, cooled down and then back into the chamber itself. Very fascinating stuff for a graphics card coming in at just under £180 right? Not too fussed about a back plate on your graphics card? No problem, as the XFX R9 380 DD doesn’t come supplied with one. One good thing however is that the PCB is all black which doesn’t look too out of place; shame the same couldn’t be said for the orange rings around the screw holes which stick out like a sore thumb! On a card of this value, however, I wouldn’t expect a back plate and given the low price and 4GB of VRAM, this card is focused on bang for buck and not bells and whistles. To power the R9 380 Double Dissipation, you are going to need 2 x 6pin PCIe cables from your power supply. XFX on their website recommend an 850w XFX PSU to do the job, but any good quality 500w will be more than sufficing; it would be like buying a Titan X for 1080p gaming, crazy recommendations! 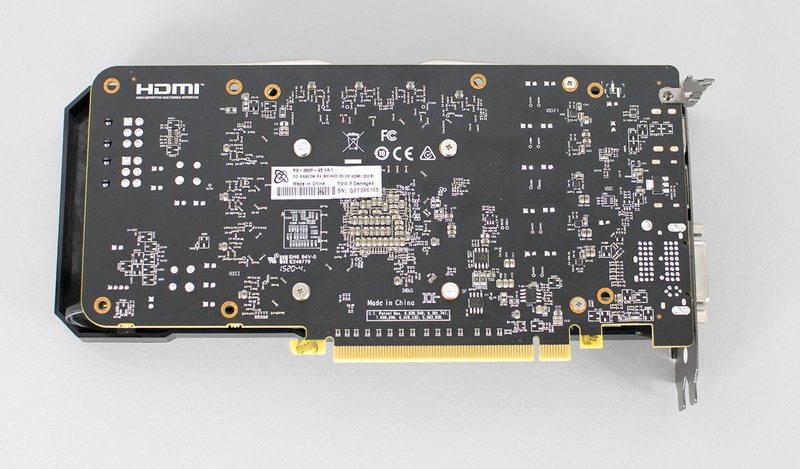 The rated TDP of this card, in particular, is around 190W and is more than powerful enough for the job. It should also be mentioned that the 2 x 6pin PCIe cables get plugged into the end of the card, something I think could have been better implemented as it doesn’t just make the cables stick out, but it looks quite unsightly when installed. However, this is just our opinion and if it doesn’t matter to you, then good! All the regular latest AMD features are supported such as Direct X 12 (when it’s released), AMD Freesync technology, Mantle (not that it matters much anymore), Eyefinity and AMD PowerTune technology. This last feature is designed to optimise the graphics card for maximum performance whilst remaining within thermal limits of the cooling solution used. Clock speed is adjusted on the fly to fit inside of the TDP of the card that is being cooled; cool right? See what I did there? Connections wise, we have 2 x Dual link DVI connectors which are capable of displaying up to 2560×1600, 1 x HDMI 1.4a and single DisplayPort which is more than capable of supporting up to 4096×2160 (4K) resolutions. The maximum analogue supported resolution, however, remains at 2048×1536 which is great if you have a VGA 1080p monitor; not everyone has switched to fully digital yet and if it isn’t broken, why fix it? To use VGA, you will need a VGA to DVI adapter as none is included inside the box. Next articleGaming – Is it all about the PC Master Race? Can I use a Corsair 500w without fear? Depends on the “quality” of the Corsair 500w? Is the CX range or something a bit beefier? I have ran more on less without problems, but it depends on how good/old your power supply unit is! Yes Corsair CX 500, currently use it with a R7 265, I doubt that because if I need to buy a new source will no longer compensate buy this xfx R9 380 but a GTX 970 would be more obvious. I saw that the R9 380 model from other manufacturers is recommended 500w.